Sorry, we are currently sold out of 'Colombia Potosi Organic'. Please check back later. Arrived January 2016, new crop. A terrific coffee from the Granja La Esperanza farm, this one is an organic coffee from their Potosi farm. The farm produces 100% of it's own organic fertilizers from their own cattle which receive natural, balanced feeding. 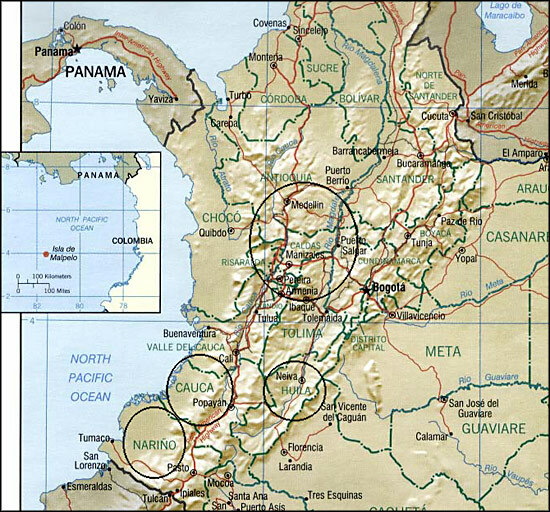 The Potosi farm is cultivated with a blend of varietals such as Typica, Caturra, Colombia and Castillo. All coffee plants are managed and certified by standards of the Rainforest Alliance, NOP, CEE and JAS, meaning that from cultivation to fertilization all processes look to preserve the environment and workers' health. The staff is so dedicated to quality and research that they recently spent two years studying the famous Geisha varietal in Panama before becoming the first producers to bring the varietal to Colombia at their Finca Cerro Azul in Trujillo. Their dedication to quality goes so far that coffee harvesters must demonstrate a level of excellence during a five month training period before being qualified to pick the Geisha cherries at the peak of ripeness. Cup Characteristics: Black licorice, chocolate fudge aroma. Flavors of tangerine, malt, and sweet red apple. Mild and clean acidity with a silky, effervescent body. The finish is light and elegant with hints of cashew nut. Roasting Notes: High grown and durable this coffee can be utilized for a variety of roast styles but will naturally reveal its more delicate nature about midway between first and second crack. This is true with the majority of fine washed coffees. That being said, the coffee is quite capable of retaining flavors at the darker end of the spectrum.